Changed to be in line with the new style for Addon distribution. That is, Libraries are no longer included with an Addon and they must be downloaded separately. The default color of numeric values for Gold and Writ Vouchers is white. I want to change the displayed values in chat to be the corresponding Gold color and pale yellow. Add controls for background coloring of the Settings Panel. Localisation is added for German Language. Other languages are possible and could be available on request. Automates the transfer for commonly used or collected items between the Bag and Bank. This is released as a Beta and is actively being developed. 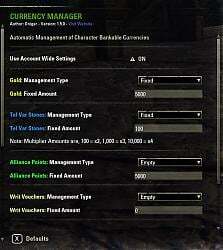 Currency Manager is based on the discontinued (2014) addon "ABnC Gold Manager" by Serunati. That is, Libraries are no longer included with this Addon and they must be downloaded separately. Note: when you are loaded on a character in-game and you look at your installed Addons then any Addon with missing dependencies (Libs etc) will now be shown in RED without a tick box. Bug Fix: The file de.lua second bug fixed. German: Initial translations added, need language feedback from users. I have a few more addons in work and wish to keep them together in the in-game "Settings, Addons panel"
This addon has now moved down in the list can be found as "Oni's Currency Manager"
The public name is unchanged in ESOUI, Minion and the Addon list on the Character login screen. 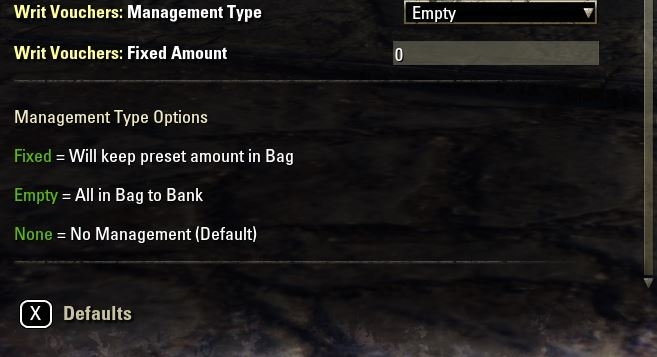 Bug Fix: It will no longer expect to transfer currencies at any of the 8 Housing Storage Coffers. Bug Fix: The file de.lua was missing a number of comma's, these have now been added. Note: the default numeric value coloring for Gold and Writ vouchers is white. I will work on this to get it Gold color and pale yellow respectively. Added thousand separator for numeric values in chat messages as well as the currency icon. I am skipping this release number. Version 1.7.0 is released to let you know about this and also so there is a later release of this addon with the interface and functionality as I designed it. For now the ability to upload optional patches is disabled. Added control for Account Wide Settings. Both Character settings and Account Wide settings are maintained separately so if you return to character settings then you have all as it was before Account Wide was selected. The Default setting for all 4 Currency Transfer Rules is now set to "None". This means on installation of the addon it will remain passive until you define the rule settings. first of all, thx for this nice tool it works great. nevertheless it´s nasty to see a UI-error at charakter login. any option to get rid of this message? Thanks for pointing this out. I found what was wrong and fixed it in the 1.9.0 release. Hmm, found a second bug in de.lua, corrected this in 1.10.0 and added my best guess at German translations. Last edited by Onigar : 08/14/18 at 02:19 AM. Last edited by Tengo : 08/07/18 at 10:07 AM. Just noticed this today and I thought it best to post the details so you can know too. The Addon uses a standard function to access the Bank but this function call treats the Housing Storage Coffer interface as if it were a Bank interface. There is no functional effect as currency transfer at this Storage interface is not possible however chat messages can indicate a transaction has taken place when it has not. Last edited by Onigar : 08/05/18 at 12:23 PM. I looked at your optional patch, it changes the addon interface and the way the addon works in a direction I do not want. It was too clear or compact? Or that text was moved from cluttering the UI to tooltips that designed to provide extra info? Or that sections not used were disabled when not used? The add-on working was not changed except by the couple added features and that calling funktions to handle a specific currency is stopped before calling the funktion instead of inside the funktion. So thank you for your enthusiasm and I guess with your code you answered my question "What extra functionality are you proposing?" however I was expecting some communication first. I tried to reach you five times on gitter over the week. The funktionality is actually 25%/50%/75% of total cash in bank while every character has their own share of total gold or everyone has their share of loot and banker has his share too. I also added percentage option as it was lot simpler than shares. Last edited by Ek1 : 07/22/18 at 12:49 PM. I am always open to suggestions. What extra functionality are you proposing. btw I don't have a Git Repo. Well, I added the feature already :-D plus I cleared up code, cleaned the UI, removed some empty funktion calls and slimmed it bit down. What i did not do was adding localization for the parts I added as I am short of time and will most likely be short of connection for good deal of time for. 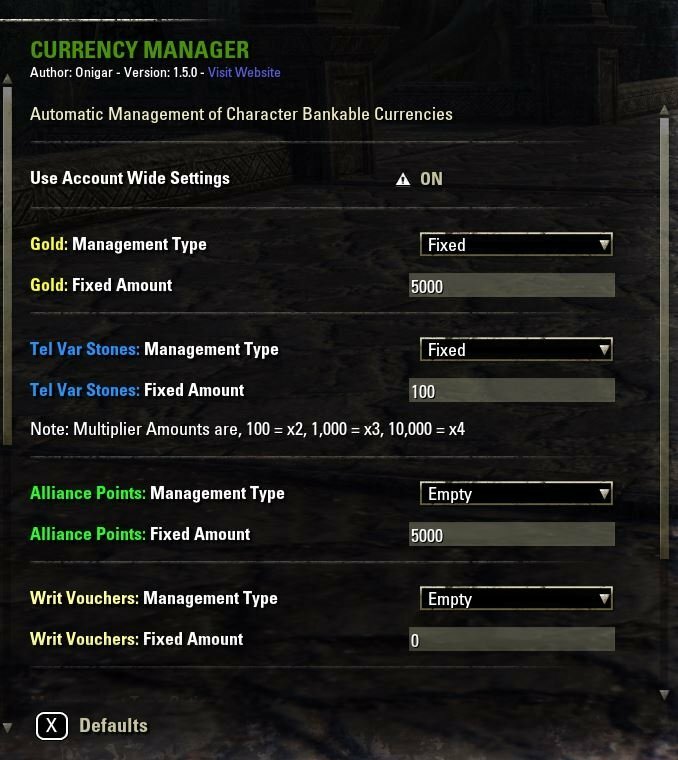 I hope you could & would either use the changes I made and help with localization or give your blessing for my code use but I would really like to see us work under the same name as Currency manager is brilliant name. I pushed a git repo about it and I would like to add you there so we could work on it? I tossed my work as optional patch for the original. That said, I am working on ToolManager that would do preaty much the same thing but with lockpicks, soul gems, repair kits and key fragments. As i understood, you are also interested to do such but sadly I can only contribute after geting back to shore. I have almost identical funktions as your add-on and some more, except there is some differences in implementation though. I also like your add-on's name more as its more precise than my BankBalancer. What would you say if I make a edit and send it to you? Or do you have a git repo for it? Last edited by Onigar : 07/18/18 at 11:50 PM. I agree and my approach will be to have a separate Addon to manage Bag Items and the transfer to/from the Bank rather than messing up the clean concept of this Addon. The TODO list will be amended. Fair enough, and the addon is doing that job perfectly. Last edited by cag_dk : 06/12/18 at 07:17 PM. Re: Re: Re: Soul Gems? Could you also implement # of both empty and filled soul gems? Last edited by cag_dk : 06/11/18 at 05:39 PM. I am currently not working so anything donated is very much appreciated. Be responsible and please only donate if you have enough income or free capital to support it.